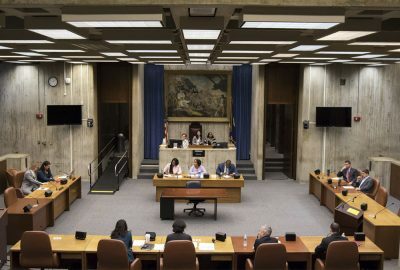 The Boston City Council voted on April 3 to declare its support for a bill in the Massachusetts Legislature that seeks to reform the state’s healthcare system. The changes aim to lower healthcare prices and expand coverage by extending Medicare to all Commonwealth residents. Councilors voted unanimously to adopt a resolution supporting the bill, S.683, which was proposed in the state Senate. If passed, the bill would restructure the state’s health industry by establishing the Massachusetts Health Care Trust, which would consolidate all healthcare plans into a single-payer healthcare system, according to the bill. District 6 City Councilor Matt O’Malley, who offered the resolution declaring the council’s support for S.683 along with District 8 City Councilor Josh Zakim, said in the Council meeting that while Massachusetts and Boston have often led the push for healthcare justice, the city and state governments needed to reduce healthcare fees. Zakim said at the meeting it was important for the Council to support S.683, as the current healthcare system did not adequately serve the people of Massachusetts. A press release on the City Council’s resolution details that recent reports indicated there are currently 20,000 uninsured children living in Massachusetts. “Establishing a single-payer health care system would allow doctors and patients to make healthcare decisions primarily based on the needs of the patients and also allows patients to access doctors and hospitals without paying premiums or co-pays,” the press release stated. Dr. Andrea Christopher, a general internal medicine fellow at Harvard Medical School, wrote in a HMS blog that a single-payer healthcare system would replace the “impressively complicated network” of insurance plans by establishing a government agency to consolidate into one plan. However, Christopher wrote the single-payer healthcare system would be similar to Medicare in that individuals would still be able to choose where they receive care, hence the “Medicare-for-all” nickname. O’Malley said in the meeting while single-payer healthcare is often labeled as a “left-wing issue,” his experience as a City Councilor has shown that this proposal also has a “conservative dimension” as the current system harms small business owners the most. Dylan Cochran, 23, of Brighton, said he approves of lowering the prices of state healthcare costs. Elizabeth Torres, 27, of Allston, said while she thinks the objectives of the healthcare reforms are good, she was concerned about how the process would be structured and how it would affect the healthcare market. Berklee College of Music student Ryan McSweeney, 19, of Jamaica Plain, said he thinks the healthcare reforms seem like a good idea and can be beneficial for people of lower income.